JOHN YANG: Pressure on Facebook has been mounting for weeks, after news broke that tens of millions of users of the social media site had their personal information exploited in ways the company had not previously acknowledged. Tensions over Facebook's business and breaches of user privacy are the focus of our weekly series on economics, Making Sense. Facebook's crisis of confidence with both its users and lawmakers is deepening with new revelations. The social media giant said it now believes that up to 87 million people, mostly in the United States, had their data improperly shared with Cambridge Analytica, the British-based political consulting firm that worked for the Trump campaign and others. Facebook CEO and founder Mark Zuckerberg also admitted that outsiders likely accessed public profiles for most of the platform's two billion users at some point without explicit permission. It's certain to intensify scrutiny from Congress next week when Zuckerberg testifies. 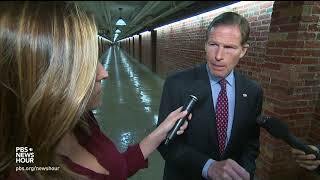 SEN.RICHARD BLUMENTHAL (D), Connecticut: Privacy is clearly at risk in America. And Mark Zuckerberg ought to be before the Judiciary Committee in public, under oath. JOHN YANG: The Federal Trade Commission is also investigating Facebook for possible violations of a 2011 agreement to protect users' privacy. The trail of trouble began with data collected by a researcher who created a personality profiling app on Facebook. That gave the researcher access to information about tens of millions of users. Facebook says all that information was improperly turned over to Cambridge Analytica. It then targeted individuals with emotionally charged content on behalf of the Trump campaign. ALEXANDER NIX, CEO, Cambridge Analytica: If you know the personality of the people you're targeting, you can nuance your messaging to resonate more effectively with those key audience groups. JOHN YANG: Last month, Zuckerberg spoke to CNN about the scandal. MARK ZUCKERBERG, Founder, Facebook: So, this was a major breach of trust, and I'm really sorry that this happened. You know, we have a basic responsibility to protect people's data. And if we can't do that, then we don't deserve to have the opportunity to serve people. JOHN YANG: It turns out Facebook was aware for at least two years that the data was being harvested in this way, but didn't disclose it until last month. Yesterday, Zuckerberg admitted he made a huge mistake. Facebook now says it will limit third-party access to data and make it easier for users to remove data-gathering apps from their profiles. The company said that on Monday it will begin alerting the users whose data was shared with Cambridge Analytica. All of this follows earlier disclosures that Russian provocateurs used Facebook to place ads and post fake news, trying to influence the 2016 election.